Alertness is associated with high levels of environmental awareness, high levels of wakefulness and low levels of fatigue, and faster mental capacity. Alertness has been shown to be strongly influenced by exposure to light and the timing of the circadian clock: alertness is lower during nighttime hours, when there are high levels of the hormone melatonin and core body temperature levels are low. Melatonin signals sleep to diurnal species, such as humans, but can be suppressed by exposure to light at night. Understanding how light affects alertness can have far-reaching implications, from decreasing sleepiness and increasing productivity in the workplace to helping airline passengers adapt to a new time zone after a long flight. 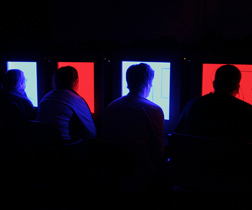 The LRC has conducted several laboratory studies and field demonstrations to investigate the impact of short- and long-wavelength light on alertness and performance. It has been shown that the circadian system is highly sensitive to short-wavelength blue light, but long-wavelength red light has recently been shown to increase objective measures of alertness at night as well as during the day. Some recent research projects regarding the effects of light on alertness and performance are highlighted below. Appleman K, Figueiro MG, Rea MS. 2013. Controlling light-dark exposure patterns rather than sleep schedules determines circadian phase. Sleep Medicine, 14(5):456-61. Scientists at the LRC are currently investigating the effects of colored light on alertness, as well as the effects of light exposure on alertness throughout the 24-hour day. Summaries of select research projects are linked in PDF format. Figueiro MG, Sahin L, Wood B, Plitnick B. 2016. Light at night and measures of alertness and performance: Implications for shift workers. Biological Research for Nursing. 17:1-8. Sahin L, Wood BM, Plitnick BA, Figueiro MG. 2014. The effects of chronotype, sleep schedule, and light/dark pattern exposures on circadian phase. Sleep Medicine, 15(12):1554-64. Figueiro MG, Sahin L, Wood B, Plitnick B. 2016. Daytime light exposure: Effects on biomarkers, measures of alertness, and performance Behavioural Brain Research, 274:176-185. Sahin L, Figueiro MG. 2013. Alerting effects of short-wavelength (blue) and long-wavelength (red) lights in the afternoon. Physiology & Behavior, 116-117:1-7. Figueiro MG, Bierman A, Plitnick B, Rea MS. 2009. Preliminary evidence that both blue and red light can induce alertness at night. BMC Neuroscience, 10:105. Plitnick B, Figueiro MG, Wood B, Rea MS. 2010. The effects of red and blue light on alertness and mood at night. Lighting Research & Technology, 42(4):449-458. Figueiro MG, Bullough JD, Bierman A, Fay CR, Rea MS. 2007. On light as an alerting stimulus at night. Acta Neurobiologiae Experimentalis, 67(2):171-178. Figueiro MG, Plitnick BA, Rea MS. 2014. The effects of chronotype, sleep schedule, and light/dark pattern exposures on circadian phase. Sleep Medicine, 15(12):1554-64. Figueiro MG and Rea MS. 2011. Sleep opportunities and periodic light exposures: Impact on biomarkers, performance, and sleepiness. Lighting Research & Technology, 43(3):349-369. Figueiro MG, Nonaka S, Rea MS. 2013. Daylight exposure has a positive carry-over effect on nighttime performance and subjective sleepiness. Lighting Research & Technology, 45(4). LRC research on light, alertness, and performance has been been featured in various media reports. A select sampling is below. For more featured media, visit our Newsroom Media Page. Mariana Figueiro, PhD, light and health program director at the Lighting Research Center in Troy, NY, stresses that in addition to minimizing bright blue-hued light—especially from gadgets held close to the eyes—at night, we should try to maximize the amount of bright light we get during the day. “It not only makes you more awake and alert by day; research suggests it may also make you less sensitive to the negative health consequences of light at night,” she says. Interview with Dr. Mariana Figueiro, Professor and Light and Health Program Director at the Lighting Research Center. "Seek light during the day from any source, electric or daylight, especially in the morning," she advises. Color — specifically, colored lighting — can affect productivity, according to an extensive body of research by Mariana Figueiro, a professor at the Lighting Research Center, Rensselaer Polytechnic Institute, a private research university in Troy, N.Y. These are among the darkest days of the year — or they would be, if we lived like our ancestors, with nothing but the stars and moon to light our way between sunset and sunrise. LRC Light & Health Program Director Mariana Figueiro is featured in this article in the November issue of Scientific American exploring the science of why electronic screens keep you awake at night. How can we harness the power of light to improve health? Mariana Figueiro, Light & Health Program Director at the Lighting Research Center, explains in her TEDMED talk. Watch the video. For more information, also see Dr. Figueiro's TEDMED guest blog post. The benefits of lighting that helps us sleep, improves our mood, reduces depression, or makes us feel more alert on the job are, simply put, priceless. James Hagerty interviews Russ Leslie for this article on daylighting in office buildings. The Lighting Research Center at Rensselaer Polytechnic Institute is developing a system that could transform people's homes and lives by regulating the amount of light to which they are exposed. At its heart is a device known as a Daysimeter, which was developed by a team led by Professors Mark Rea and Mariana Figueiro. For a good night's sleep, here is some expert advice: Turn off, turn in and drop off. Anyone who does the opposite—say, turning on an iPad or other similar electronic reader in bed—may have a harder time both dropping off to sleep and shaking that groggy feeling the next morning. LRC Director Mark Rea discusses how a 24-hour lighting scheme could improve health and productivity. David Crouch interviews Mariana Figueiro for The Guardian (UK) on light & health and a school in Sweden's far north that has recently installed special lighting to improve mood, raise performance, and help students through a long, dark winter. Mariana Figueiro is featured in this Q+A with TL magazine editor Gillian Anderson. Alejandra Martins interviews Mariana Figueiro for BBC Mundo (BBC Latin America). You probably spend more time staring at a screen than you think. But is it bad for you? BBC's Holly Cave interviews light & health expert Mariana Figueiro. Mariana Figueiro's Light & Health research is featured in this article by Claire Thompson. Part 1 of a two-part series exploring light's effect on human health. Many people experience a period of reduced alertness in the afternoon, what researchers call the post-lunch dip. Exposing people to red lighting may improve their energy during this period, according to a study in Physiology & Behavior. Using the right light for the right time of day can enhance a person's comfort level and alertness. Use the wrong lighting, however, and a passenger's favorable flying experience could fly out the window. View a list of publications, journal articles, and conference papers on light and health issues by Lighting Research Center scientists.